After three weeks in La Cruz de Huanacaxtle, we are finally ready to continue south. We plan to leave tomorrow. Leaving is bittersweet this time. On one hand, we are antsy to keep sailing and to experience Southern Mexico and Central America. We’ve completed lots of maintenance and other projects, so we feel very well prepared. On the other hand, we’ve been so comfortable and content here, it’s a little hard to leave. Unlike many other lovely coastal towns in Mexico, La Cruz has managed to avoid major tourism and development. The streets are quiet and safe. The restaurants are affordable and the business owners are friendly. The large cruiser community means there are enough boat services to meet all our needs. We look forward to the farmer’s market each Sunday, the paleteria (ice cream and popsicle shop) almost nightly, and the easy company of new cruising friends. And that’s the hardest part: saying goodbye. When we head south, we’ll be breaking away from friends who are staying behind to prepare for the Pacific Puddle Jump (annual migration of boats from North America to Polynesia) in the spring or spending the entire season cruising in Mexico. 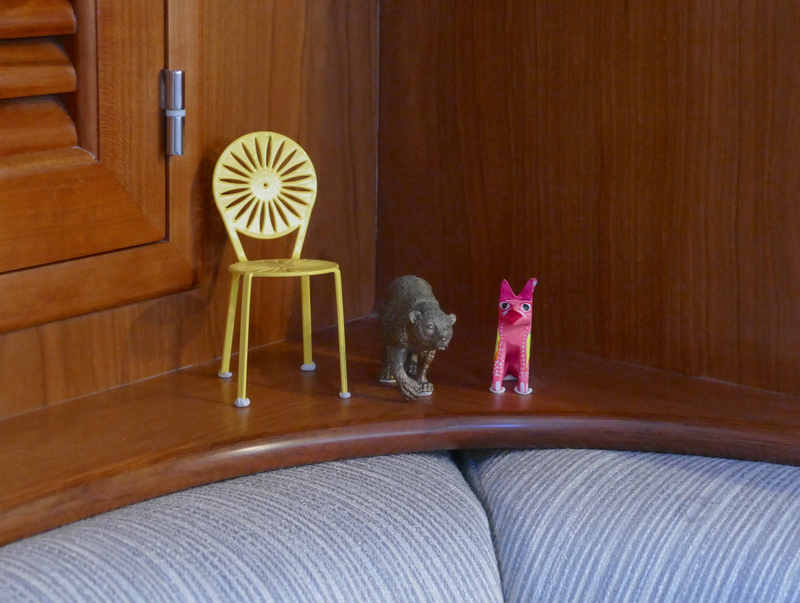 Staying in one spot for this long has given me the chance to put together a tour of the inside of our tiny, floating home! I know you’ve been curious! So, take your shoes off (it’s a new boat, after all) and welcome aboard! I’ll show you around and share some of the details we love on our Outbound 46, Pineapple. 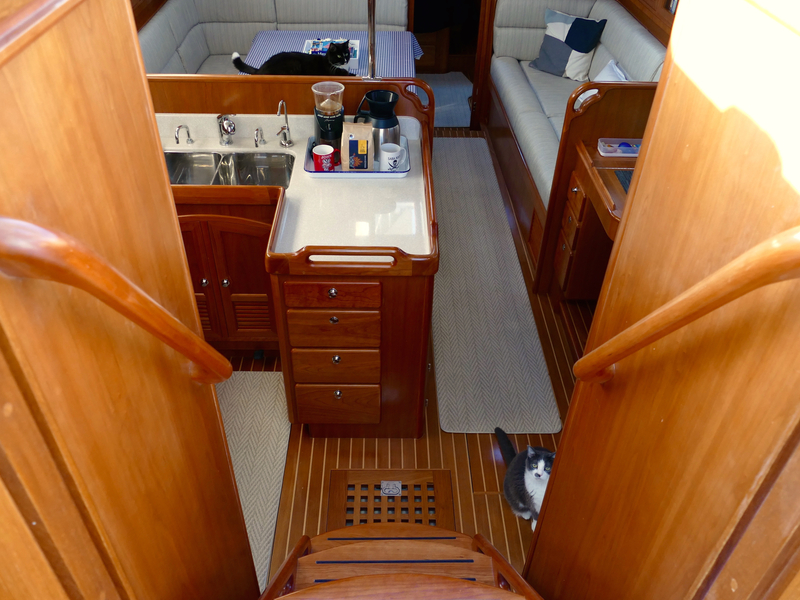 Here is the view stepping into the companionway (front door) from the cockpit. 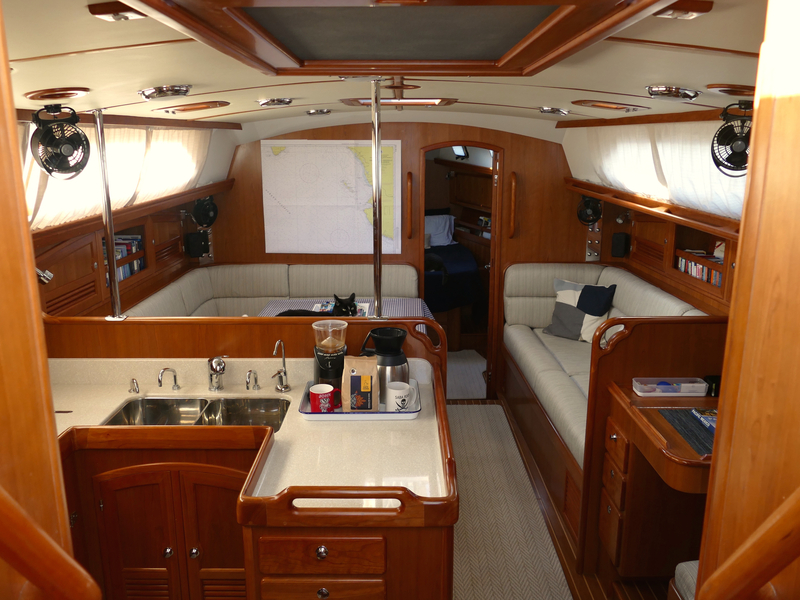 There are three big, wide steps that make going below deck easy, even when our hands are full. And there’s plenty of room to step around the cats when they are sitting on the steps (which they do often). At the bottom of the stairs, the grate catches a lot of the dirt we track inside—it falls into a removable dust pan just below the floor. 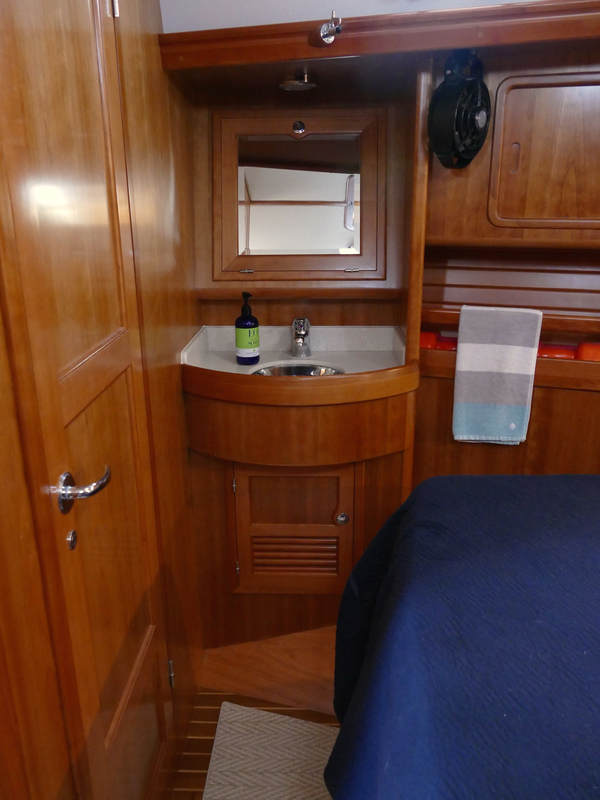 Looking into the boat from the companionway, you can see the galley (kitchen), salon (living room), and navigation desk. 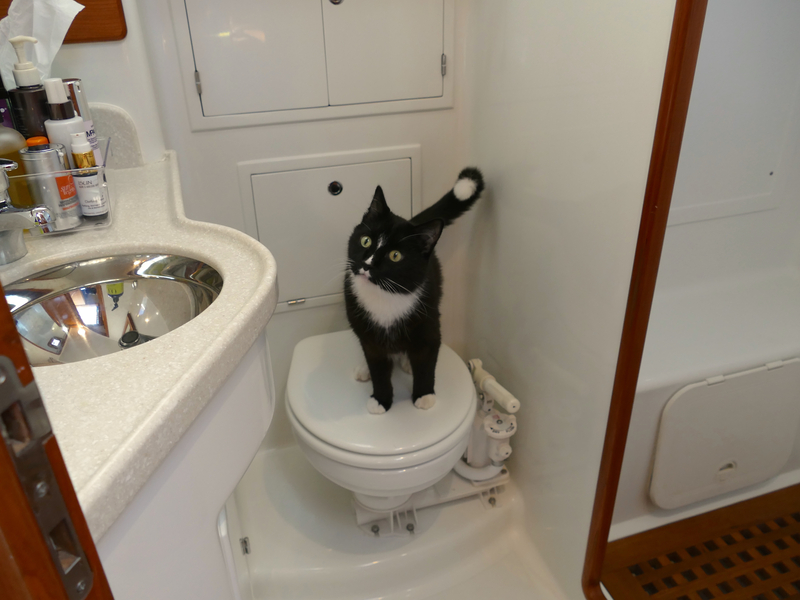 This is where we spend most of our time when we are below deck. Look closely for all the railings and hand-holds, which we use to move around safely when we are underway. Here’s a closer look at the galley. 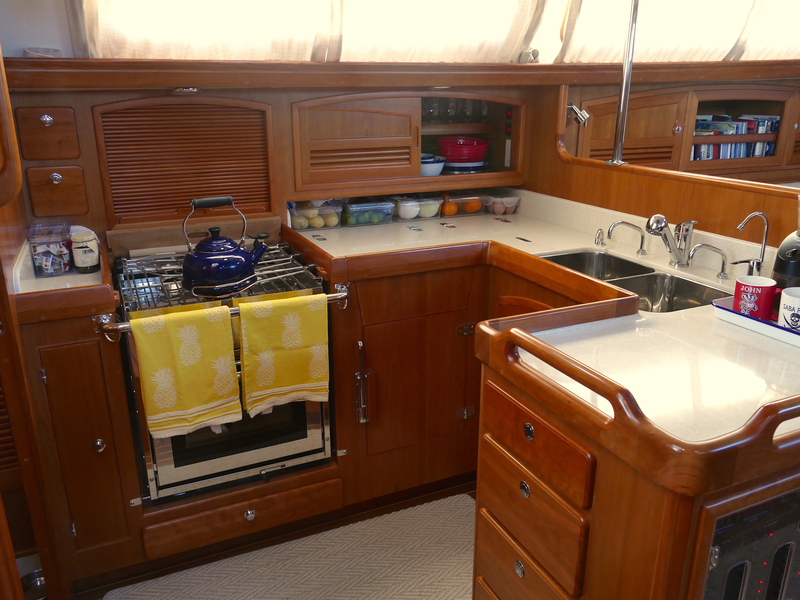 Fun fact: We have more counter space on the boat than we did in our apartment in San Francisco! Our stove, oven, and broiler are fueled by propane. (Two tanks are stowed in a special locker in the cockpit, and checking for leaks is part of our routine maintenance.) The cabinet behind the stove is designed for a microwave, but we don’t have one, so we use the space for dry food storage. At the sink, you’ll notice an array of extra faucets. Two are connected to manual foot pumps (one for seawater, and one for freshwater from our two 100-gallon tanks) which conserve electricity and water, and serve as backups if our electric water pump fails. The hinges on the counter are the refrigerator and freezer doors. 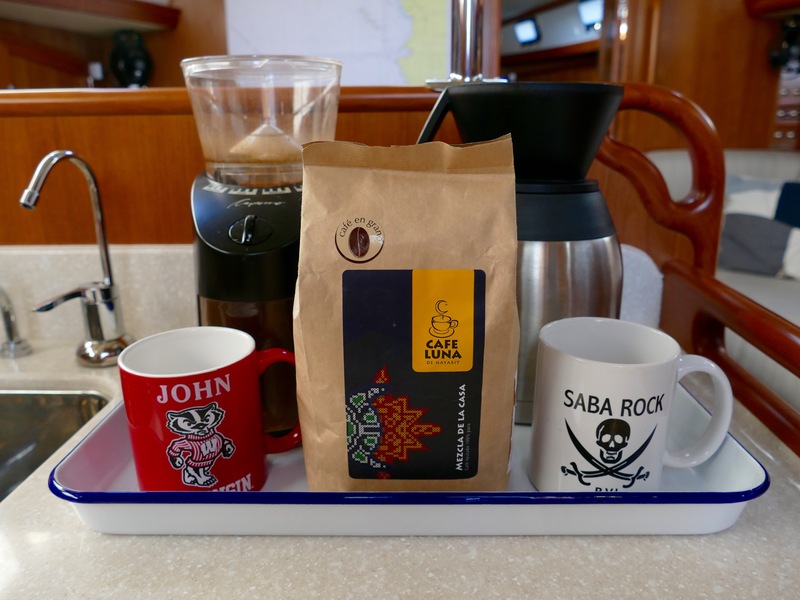 This tour is also a chance to show you our coffee setup on board. Making coffee is part of John’s morning ritual, and “But first, coffee” is definitely our mantra around here. John heats water using an electric kettle (not pictured) or the tea kettle you saw on the stove. Our coffee grinder is a galley essential, since we refuse to buy pre-ground beans. We prefer drip coffee, so we hand-pour water into this awesome Melitta 10-cup pour over coffee maker with thermos. 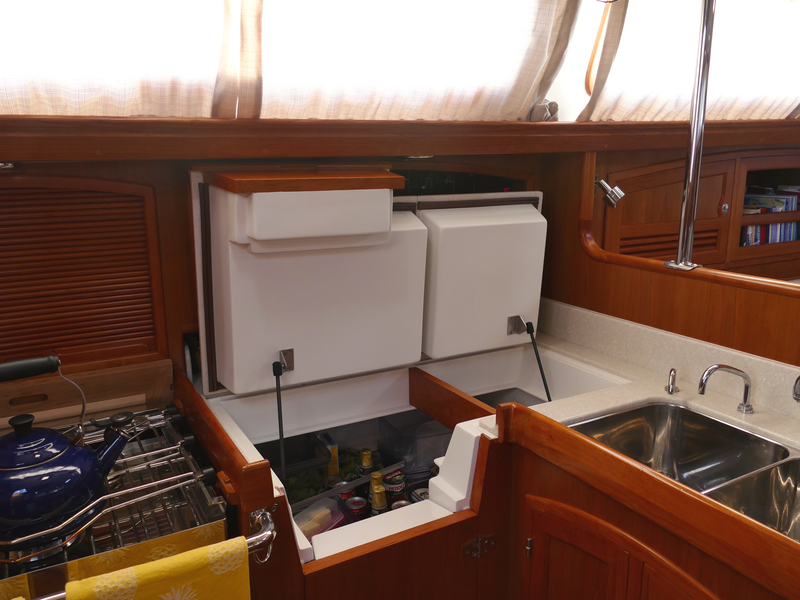 On the other side of the counter is the boat’s main circuit-breaker panel, access to fuel and water valves below, and to the right, a huge cabinet with more storage, which we use for pots and pans and other large dishes. Moving on to the salon, we have plenty of space to lounge, dine, and work in the U-shaped dinette. This area is full of neat features: The table cranks down and creates a bed. The settee (bench) cushions lift up for access to storage. Behind the seat-back cushions are more storage cabinets. 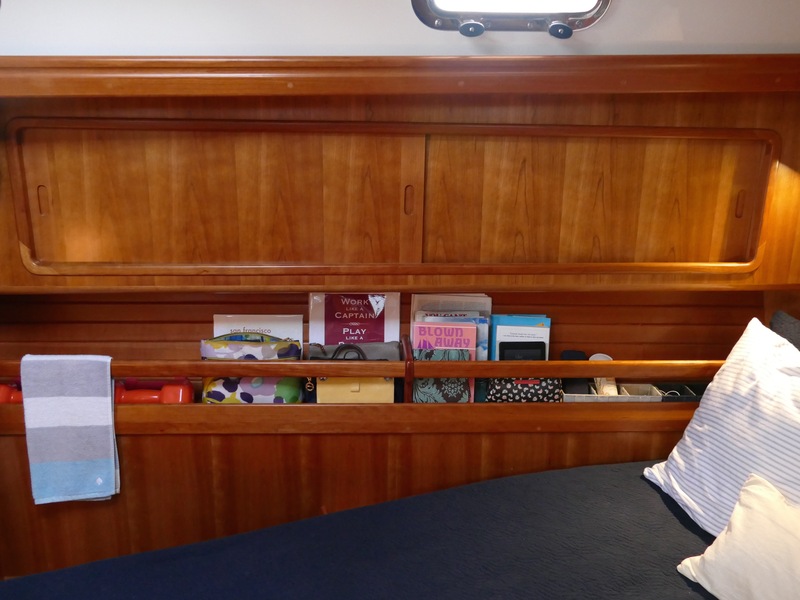 Our bookshelves (with removable railings to keep books from flying) are filled with nautical reference books, cookbooks, travel guidebooks, cruising guides, and some favorite novels. 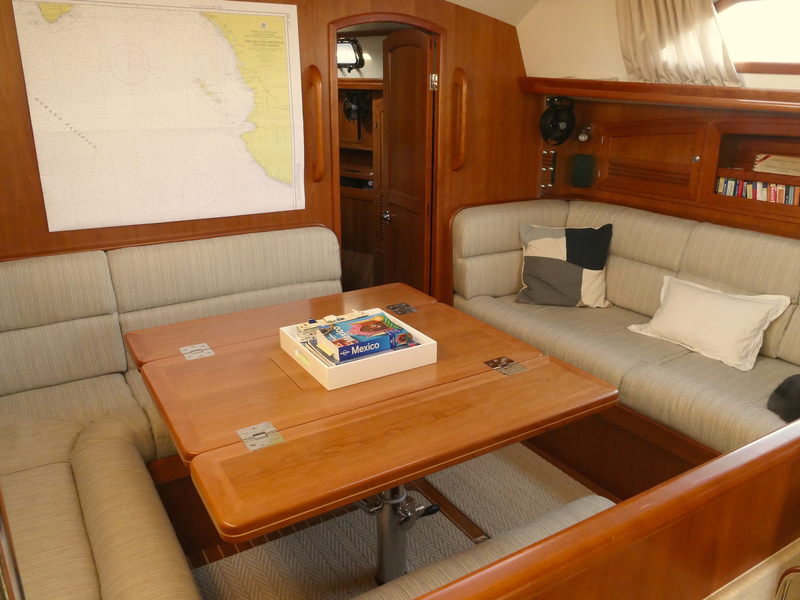 Another clever space on the boat is behind the middle cushion on the starboard settee. (By the way, “starboard” refers to the right side of the boat when looking forward. “Port” is the left side of the boat.) 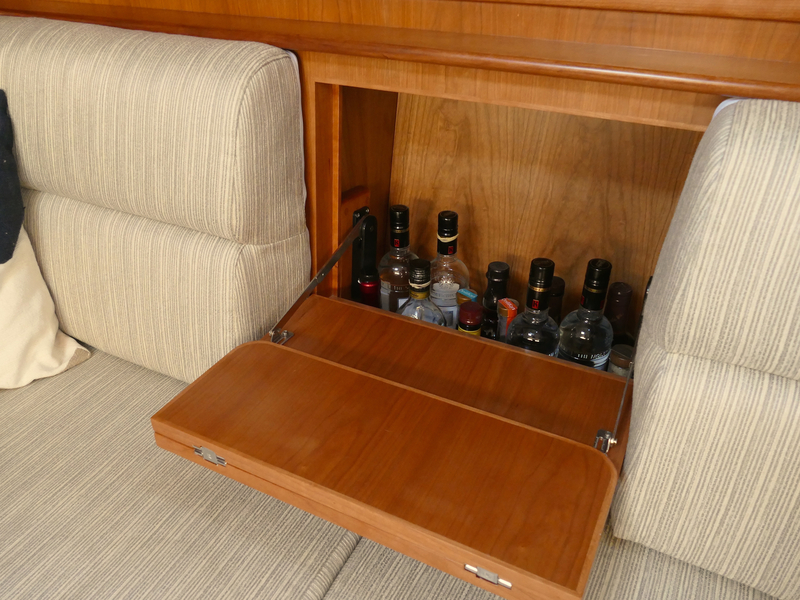 If you remove the cushion, a fold-down cabinet door reveals bottle storage and a little cocktail table. Bar is open! 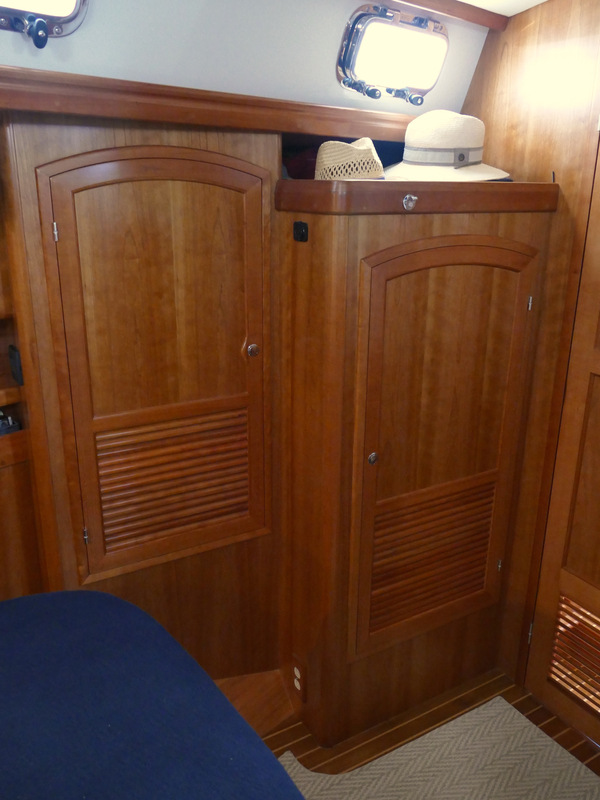 Many boats use the huge bulkhead (that’s the nautical term for a structural wall) in their salon for a flatscreen TV. Not us! We haven’t watched any shows in months, and I only miss it a tiny, tiny bit. 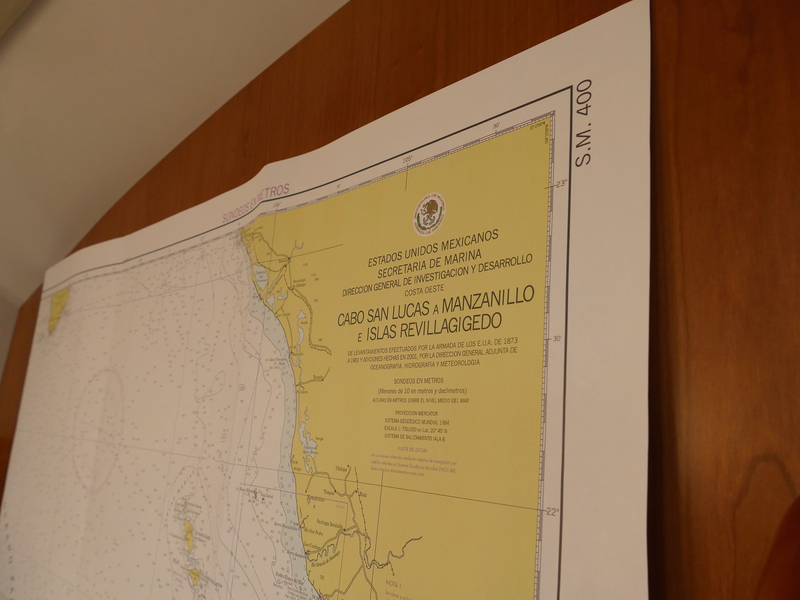 We could not decide on a piece of artwork we wanted to look at constantly, so hanging nautical charts here has been the perfect solution. We are map lovers—we like the aesthetics and they are always interesting to look at. And in this case, the charts help us with route planning and keep us excited about the next stop! You may have noticed there’s not much in the way of decor around the boat. 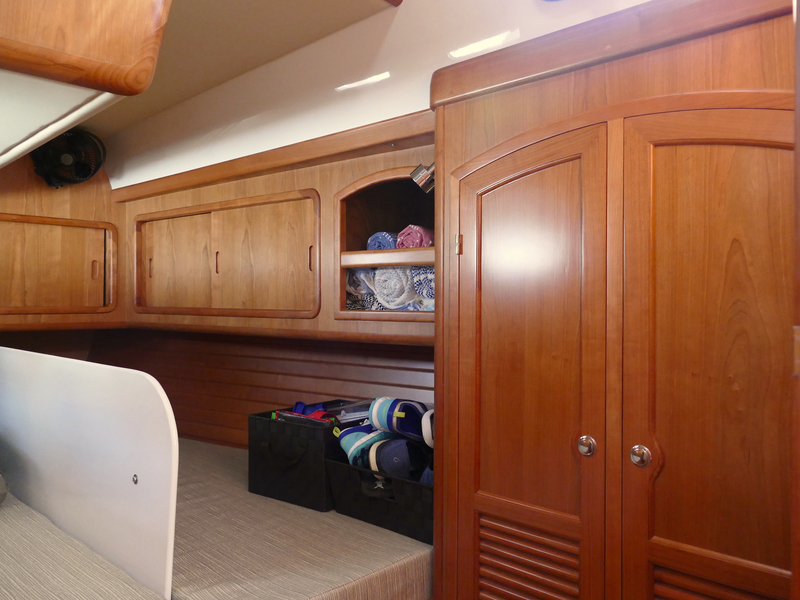 We do like a simple, uncluttered boat—but really, I have no idea how to decorate, so I’ve just avoided it. Tucked away in a corner of the salon, though, we have a few knick-knacks that add some color and have some personal significance. If you’re from Wisconsin, you probably know where to find these chairs in their normal size: they are on the lakefront terrace of the UW-Madison student union. That’s where John and I went to college, and it’s where we met. The chairs are a Wisconsin icon. The golden bear reminds us of California, which we were lucky enough to call home for eight years. This bear was a decoration from my stepbrother Ben’s wedding. And that colorful cat? We bought it in Ensenada as our “right now” keepsake—a souvenir from traveling Mexico with cats! Bilge pumps switch: If water gets in the boat, the bilge pumps remove it. We always leave these switches set to “auto,” so the pumps will come on automatically when needed. Battery charge monitor: We have 10 batteries aboard to power everything from autopilot to reading lamps. Navigation display: Called a “chartplotter”, we use ours for radar and vessel identification. Stereo: Connects via bluetooth to an old iPhone. We have speakers in the salon and outside in the cockpit. 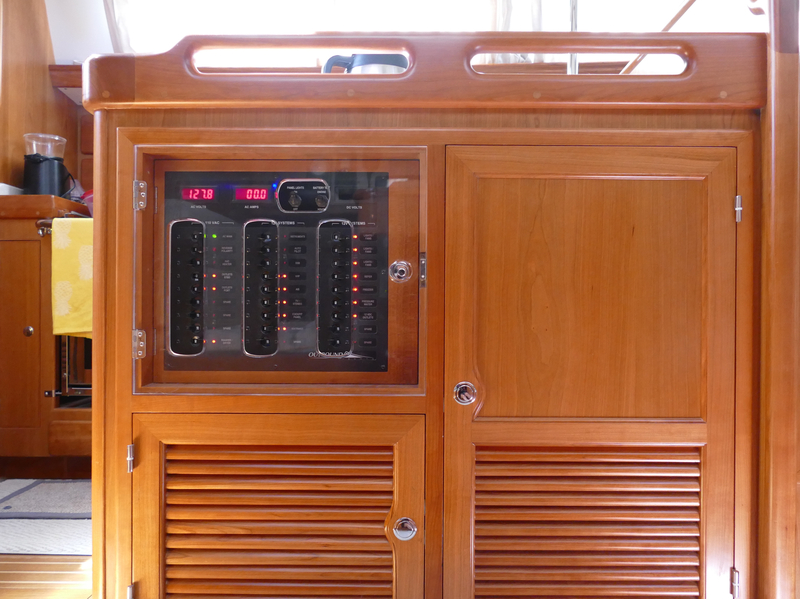 VHF radio: Used for short-range communication between boats, marinas, port captain, etc. Satellite phone: We use it primarily for (very very slow) Internet access, for email and weather only. It can also do text messages, and phone calls too! Tank Tender: To measure fuel and water levels. Control panel for the inverter, which allows us to plug in normal 110-volt appliances and run them off the batteries. 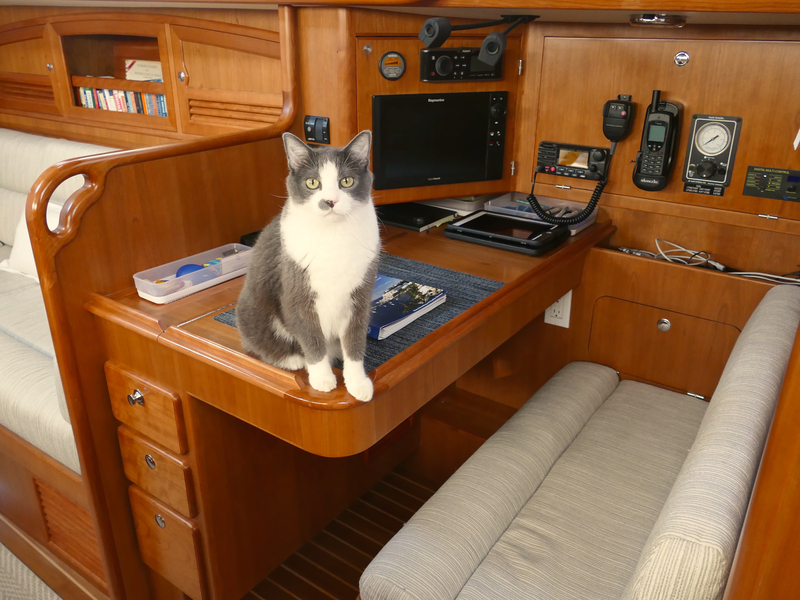 We also have two USB plugs at the desk to charge phones and iPads, and the desk opens up (when there’s no cat sitting there) to store paper charts and navigation tools. 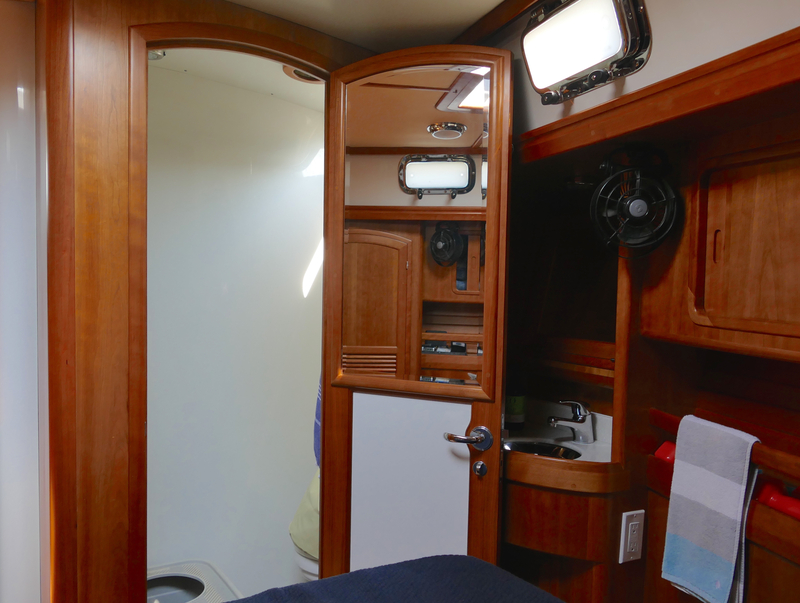 Moving forward from the salon, you enter the forward cabin. 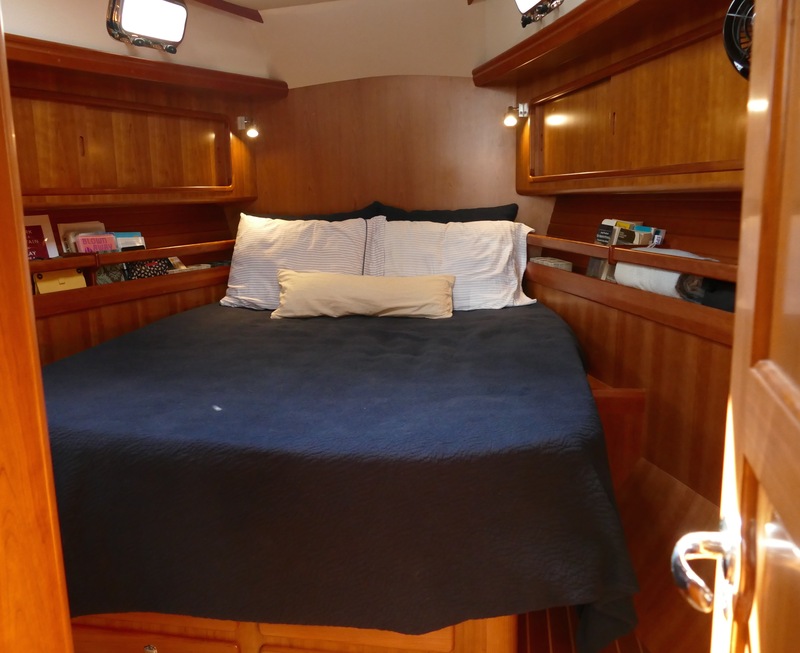 This is one of two bedrooms on the boat. 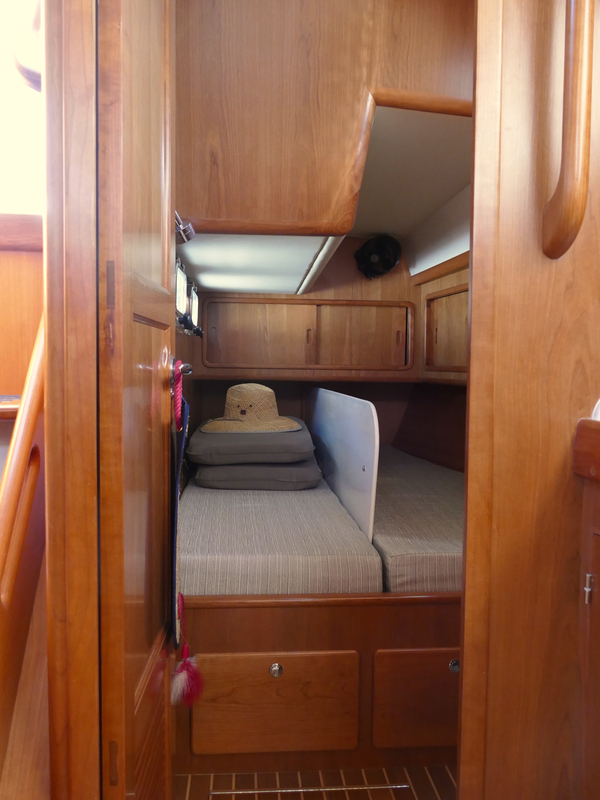 The forward cabin has a queen-size bed, and it’s designed with enough space to sit up in bed and read, which we love. The bed lifts up for, you guessed it, more storage! On each side of the bed are cabinets and shelves for our stuff. Everything is designed to stay secure underway, so even this shelf has a railing. Around the corner from the door are two closets—one with shelves and one for hanging clothes. We also have a head (bathroom) in our cabin that we don’t really use. It’s tiny, and it’s also where we keep the litter box for the cats. So, yes, the cats have their own bathroom. There’s a vanity behind the door to the head, which I use all the time. The mirror folds down and has two large shelves with plenty of room for all of my products. And another closet! This one we use for our pantry and linen cabinet. 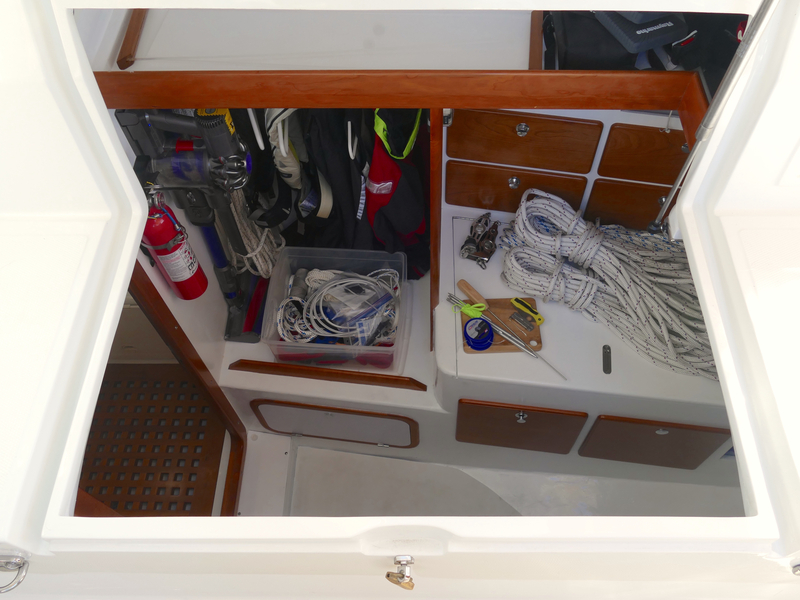 If you turn to starboard at the bottom of the companionway, you’ll enter the aft head. This is our main bathroom, and what you see in this photo is our shower. 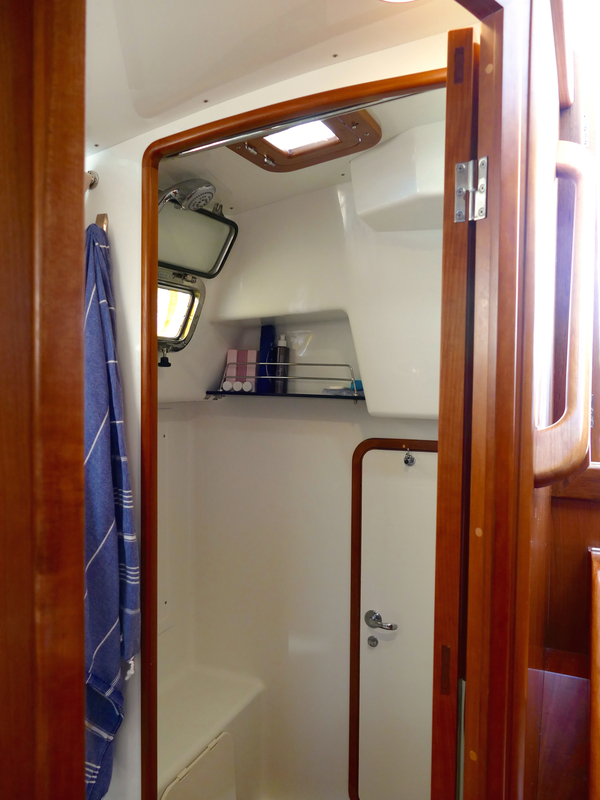 A separate room for the shower is a big luxury aboard. 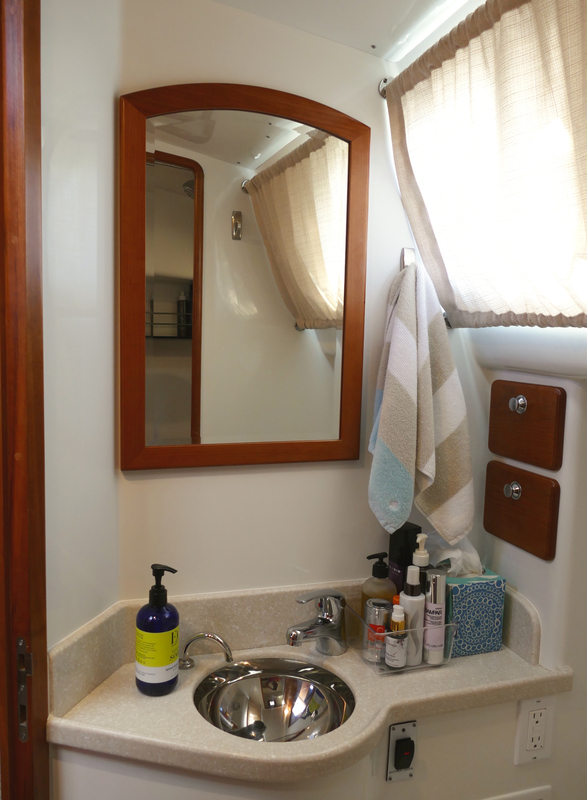 Many boat showers (including on our last boat) are in the same room as the head, so the whole bathroom gets wet when you shower. Notice the small door in the shower? We’ll get back to that later. Standing in the shower looking forward is the second room of the head with sink, toilet, and of course, more storage. Under the sink, we have at least 30 rolls of toilet paper. Always be prepared! And how can I spice up a photo of a toilet? I know! Just add cat! And finally, I’ll take you through the tiny door in the shower. It leads to one of the most special features of the Outbound… a workshop! This view is actually from outside the boat looking in (the shower is to the left). 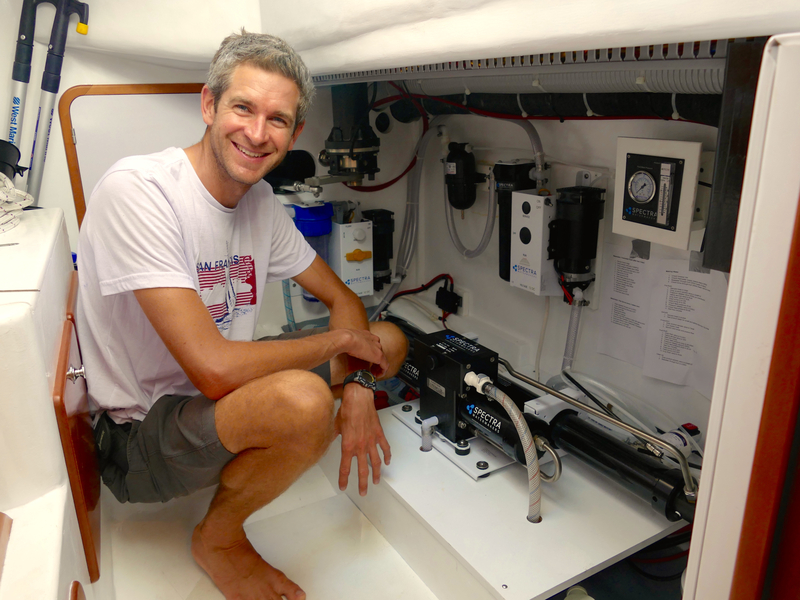 We keep tools and even more spare parts in here, along with waterproof “foul weather” gear, life jackets, and our trusty Dyson vacuum (another essential given the amount of cat hair we have on the boat). The workshop is also where the magic happens. And by magic, I mean making fresh drinking water from the sea. Here’s John with our desalinator, or watermaker, which removes salt from seawater at a rate of 15-18 gallons per hour. It is our single biggest luxury, and although maintaining it is a lot of work, we are so happy we do not have to worry about taking on water throughout Mexico and further south. So there you go! Our cozy, functional 46-foot floating home. Moving onto the boat has given us more bedrooms, bathrooms, places to sit, and a larger kitchen than our apartment in San Francisco. Plus, we can sail it to amazing places. It’s been quite the upgrade! So great to get to see the inside of your tiny, transient home! Miss you guys and love reading about your adventures! We miss you guys tons! Glad you liked the tour 🙂 Stay warm out there! Thank you! That was SO interesting and what a lovely boat. Of course one thing I’d be doing is looking for all the seabirds that pass by your boat regularly. Albatross, Shearwater, Storm-Petrel, etc… What a list you could acquire! Be safe and keep writing. Glad you liked the post! We are so focused on identifying all the sea life in the water, we are unfortunately not well informed on the birds! That was really fun tour! Having been fortunate enough to be with you and John on Pineapple, it was still fun. Fair winds! Amazing! When are you and John going to traverse the great lake of Lake Superior. I hear Duluth is a really nice port city. Happy to see John’s badger mug made the voyage. Great tour Michelle, it reminds me of my father’s last large cruiser, which was about the same size as yours. He lived aboard his boats (in the Delta of central California) for almost 20 years, before remarrying and living in a residential neighborhood again. He learned to live minimally, and loved it. Enjoy your life at sea and thank you for sharing your experiences. Hi Renee – I missed this comment somehow. Bruno mentioned once spending time in the Delta. We loved it up there – went every summer in our last boat. Thanks for your note!